As the 2017 Korea Baseball Organization season enters the annual All-Star break, two sluggers surnamed Choi are locked in a duel for the league's highest individual honor. Choi Hyoung-woo of the Kia Tigers and Choi Jeong of the SK Wyverns are not related, but they'll keep hearing their names mentioned together in MVP conversations the rest of the season. After starring for the Samsung Lions for several years, Choi Hyoung-woo signed a four-year, 10 billion-won (US$8.79 million) free agent deal with the Tigers in the winter, and has been worth every penny so far. Choi leads the KBO in six offensive categories, including RBIs (81), walks (62), on-base percentage (.481) and slugging percentage (.689). Choi is second in batting average (.374) and runs scored (72). He was the runner-up to Doosan Bears ace Dustin Nippert in last year's MVP voting, and appears to be the front-runner this year, especially with the Tigers sitting in first place at 57-28, eight games up on the NC Dinos. The Tigers' offense as a whole has been deadly. Kim Sun-bin is leading the league with a .380 batting average, and four more players -- Lee Myung-ki (.353), An Chi-hong (.333), Na Ji-wan (.326) and Roger Bernadina (.314) -- are hitting better than .300. The Tigers are leading the KBO with a .310 average as a team. 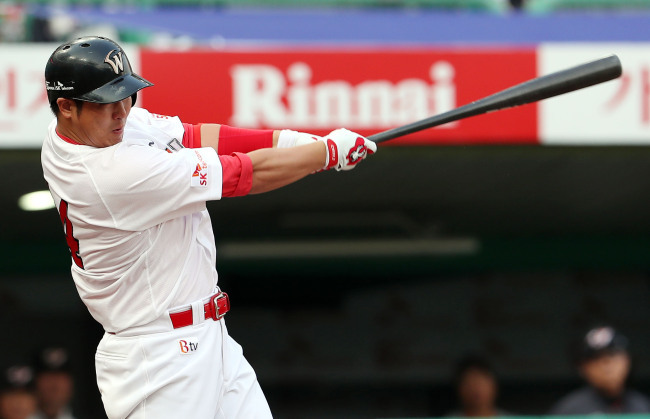 The Wyverns are ranked last with a .265 average but led by Choi Jeong's KBO-best 31 home runs. They have launched 153 long balls to lead all clubs. That's a whopping 54 more than the Tigers and Doosan Bears, who are tied for second. Choi Jeong, who's spent his entire 13-year career with the Wyverns, is second to Choi Hyoung-woo in RBIs (71), slugging percentage (.672) and on-base percentage (.429). In the standings, the Wyverns are in third place at 48-39-1 (wins-losses-ties). Choi tied for the league lead in 2016 with 40, and is well on his way to surpass that total. The 30-year-old could also become just the fourth KBO player to hit 50 homers in a season. Lee Seung-yuop and Park Byung-ho have each done it twice, and Shim Jung-soo has had one 50-homer season. The Tigers also produced stars on the mound. Former major league right-hander Hector Noesi has gone 14-0, tying the KBO record for the longest winning streak to start a season, while his teammate Yang Hyeong-jong, who began the year 7-0, is now at 13-3. They're trying to become the first pair of teammates to each win at least 20 games since Kim Si-jin and Kim Il-yoong had 25 wins apiece for the 1985 Samsung Lions. Park Se-woong has emerged as an unlikely pitching star for the middling Lotte Giants. The bespectacled 21-year-old, in his third KBO season, has gone 9-3 with a 2.81 ERA in 17 starts. Despite some recent struggles, Park continues to lead the KBO in ERA. He is one of just four starters with an ERA under 3.00 in this offense-happy league.